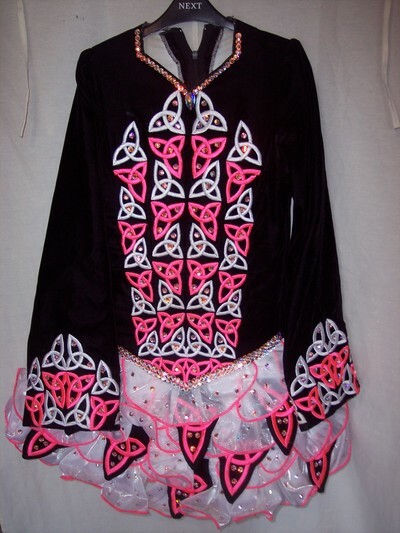 Black velvet bodice with hot pink and white Celtic traditional design embroidery. 3 tier distinctive white satin soft ruffle skirt, dress comes with unique shawl which complements the skirt. 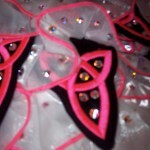 500 genuine Swarovski crystal have been added to bodice and skirt for extra sparkle. 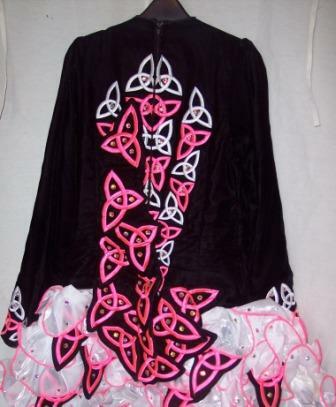 This dress is in excellent condition and very up to date – yet design is individual. 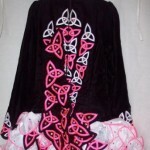 Dress comes complete with pink diamante headband, additional alice band and kick pants. Dress is just over 1 year old. Asking price Â£875 Stg. Measurement are approximate, please email for additional measurement. Dress has not been offered, let down and let out available. Asking Price: Â£875. Shipping costs not included in the asking price. Sale is final.